applications simultaneously without any user intervention. increasing efficiency, productivity and profitability. Digital Writing C2P is the ultimate front-end document and data capture solution for Tablets and Paper used by millions in over 130 countries and 33 different languages worldwide. The reason for its success is that it lets your business use all your documents (internal/external) as is in any area of the business without changes, eliminating the time and cost of upfront development, customization or re-engineering your documents or business processes. This single solution can be shared with unlimited users across multiple departments. Digital Writing C2P complements all your workflows, supports business rules and logic and can be seamlessly integrated with all your back-end applications. Digital Writing C2P (capture-to-process) bridges the gap between document and data collection and your back-end business applications. It seamlessly Captures, Validates, Processes and Integrates your mission critical documents with your cloud or on-premise applications delivering a real-time capture-to-process solution. Turn all your documents as is into a one-touch paperless solution without upfront programming, development or specialized skills. Optimized for Tablet technology, you get all the features available through the Tablet including keyboard, voice and handwriting inputs. With the touch of a button your documents are captured, validated and imaged to high-resolution PDF and delivered to your back-end office applications in real-time. 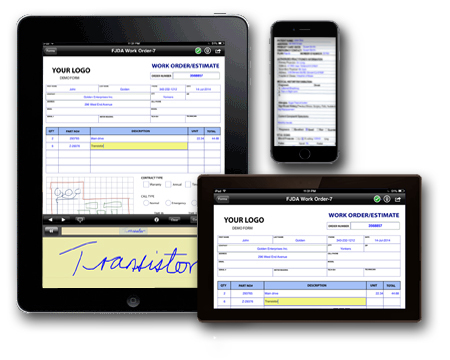 All handwriting is transcribed to type text and data files are created for all data entered in the document. 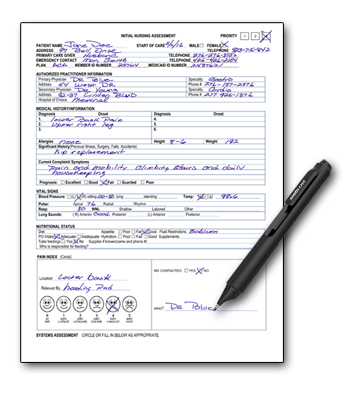 Using your existing paper documents printed as is to any laser printer (on demand) simply complete your forms as you normally would with the Digital Pen and with the touch of a button your documents are captured, validated and imaged to high-resolution PDF and delivered to your back-end applications in real-time. All handwriting is transcribed to typed text and data files are created for all data entered in the document. This single APP can be shared with unlimited users across multiple departments. Users login to access their specific processes and documentation eliminating multiple devices, multiple Apps and a host of fees, licenses, development and support cost.